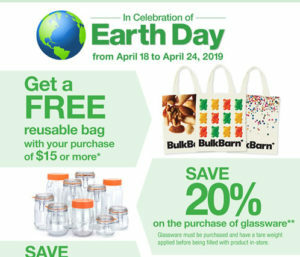 In celebration of Earth Day, from April 18th to April 24th 2019, get a FREE reusable bag with your purchase of $15 or more. Save 15% when you shop with your reusable containers and save 20% on glassware. Limit of one free bag per customer per store visit, while supplies last.